Gopal Gose was born in 1913 in Shyambazar in Calcutta, West Bengal. His childhood and adolescence were spent in Simla, Benaras and Allahabad. In 1929 he studied at an Anglo - Bengali College in Allahabad up to Intermediate level studies. He left college to join the National Movement, sustained a bullet while de-hoisting the Union Jack. In 1931 he studied at Maharaja School of Arts and Crafts, Jaipur and in 1935 he received his Diploma in Painting. In 1938 he completed his study from GSA, Madras and joined as an art teacher in B.T. Department of Scottish Church College, Kolkata. In 1943 he was the founder member of Calcutta Group, Kolkata. From 1940 - 1945 he joined as a teacher at the Indian Society of Oriental Art, Kolkata. 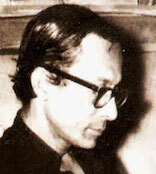 From 1956 - 1972 he joined Government College of Art and Craft, Kolkata as the teaching staff. In 1931 Gopal participated in a group show, London. In 1940 - 1947 he took part in a group show at Birla Academy of Art and Culture (BAAC) in Kolkata. In 1944 he had a solo show at 3A, S.R. Das Road, Southern Avenue, Kolkata. In 1944 he taught architectural drawing at Faculty of Bengal Engineering College. In 1946 he showcased at the Calcutta Exhibition. In 1947 he showcased at Exhibition Hall, Parliament Street. The show was opened by Jawaharlal Nehru. In 1947 he participated in a group show at All India Fine Arts and Crafts Society (AIFACS) - New Delhi. In 1950 he participated in Calcutta Group & Bombay Progressive Artist's Group, Kolkata. In 1952 he had his first solo exhibition in Kolkata. In 1950 he and Rathin Mitra (both former members of the Calcutta Group) join the Government School of Art & the Academy of Fine Arts, Kolkata. In 1953 he had a solo exhibition in Mumbai (which was opened by Chief Minister Morarji Desai). In 1963 he left for a tour to USA: Part of the Foreign Leader Programme of the Bureau of Education & Cultural Affairs, U.S. In 1964 he exhibited his paintings at USIS Auditorium, Kolkata. In 1968 he along with his student and artist Bishnu Das visited Santiniketan, where he met Ram Kinkar Baij, Binode Behari Mukherjee and Mukul Dey. In 1968 he had an exhibition at Raindrop Bhavan, Jamshedpur. In 1970 he exhibited at the Birla Academy of Art and Culture in Kolkata. In 1972 he retired from the Government College at Art & Craft, Kolkata. In 1979 he was represented in an exhibition Art of Bengal at the White Chapel Art Gallery in London and the Manchester City Art Gallery in Manchester. In 1980 Gopal passed away. In 1983 he was showcased at the Birla Academy of Art and Culture, Kolkata. In 1986 he was showcased in Trends of Bengal Art at Commonwealth Institute, London. In 1987 he had a retrospective at Chitrakoot Art Gallery, Kolkata. In 1986 - 1987 he had a retrospective at Art Heritage, New Delhi. In 1988 he was exhibited at Gallery BF-14, Salt Lake, Kolkata. In 1991 he was showcased in ‘From Kalighat to Gopal Ghose’ at the Durbar Hall, Victoria Memorial Hall, Kolkata. In 1993 he was exhibited at Gallery Ganesha in New Delhi. In 1995 he had a retrospective at Birla Academy of Art & Culture, Kolkata. In 1996 he was showcased in Exhibition of ex-teachers and ex-students of Government College of Art & Culture at the Eastern Zonal Cultural Centre by Lalit Kala Academy, Kolkata. In 1997 he was showcased in a show Gopal Ghose; The Pre-Independence year at Birla Academy of Art & Culture, Kolkata. In 2009 he was exhibited at Ganges Art Gallery in Kolkata. In 2012 he was showcased in Gopal Ghose; A Jubilant Quest for the Chromatic organised by NGMA in New Delhi.